Alice Zhang is Senior Faculty Specialist of Department of Teaching and Learning, Policy and Leadership at College of Education of University of Maryland College Park, as well as Associate Director of Multilingual Research Center since 2015. Before then, she was the Chinese Teaching Expert and Director of the Center for Chinese Language Teacher Certification and Development at the University for 5 years. Alice has been selected as College Boards’ Workshop Consultant/Presenter for AP Chinese Language, an active program reviewer of Council for Accreditation of Educator Preparation (formerly NCATE) since 2014. In addition, Alice works for College Board as a certified AP Chinese Reader, and for the World Bank as an educational consultant. Before joining in the University, Alice had been a special educator for 13 years at Baltimore City Public School System. She helped establish the Chinese Immersion program at Baltimore International Academy and guided BIA through the application process for International Baccalaureate (IB). As the founding president of Chinese Language Teachers Association at National Capital Region, she worked hard with the team to found the organization and assisted it to become a registered non-profit educational organization. Alice has been also a Startalk site visitor since 2011. Her research interest is teacher preparation and teacher development. She has organized numerous professional development workshops including online and brought experts of the field from the worldly recognized to the experienced classroom teachers. 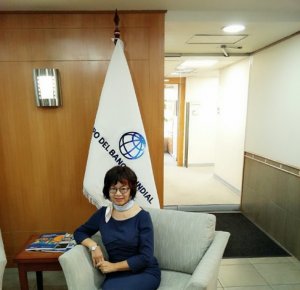 She has also presented at various national and international foreign language conferences with the topics focusing on 21st language teaching and learning. This course will focus on the AP Chinese Language and Culture course and exam in relation to World-readiness Standards that serve as overarching principles for the development of curricular framework. Consultant and participants will discuss and brainstorm research-supported best practices, illustrate step-by-step instructions for creating a truly communicative and interactive immersive setting, and demonstrate effective instructional strategies in enhancing student performance in all three modes of communications (interpersonal, interpretive and presentational). Participants will gain hands-on experiences in assessing student responses by using grading criteria and rubrics applicable for AP Chinese and develop sample formative and summative assessments for their local classrooms. The entire group will also share and examine effective instructional resources.